When I first moved to Seattle, it was July. I stayed with a friend on the Peninsula for two months, commuting by boat to downtown Seattle beneath glorious clear skies. The weather stayed like that through the fall – never too hot, never too cold, and so little rain that I wondered how the city had earned its reputation. I mentioned this at my office Christmas party in early December, and my coworker replied, wait until February. I laughed, and he laughed. By February, I was suicidal. People in New York City in August like to says this whenever someone complains about the heat: It’s not the heat, it’s the humidity. I never said that, because in the first place, everyone says that so there’s really no point in repeating it, and in the second place, it’s both. And so it is in Seattle in February: It’s not the rain, or the darkness, it’s both. Every year, by the time February rolls around, I am ready to kill someone, and anyone will do. It’s the little bright spots that see me through. When the sun comes out, even briefly, everyone who possibly can go outside, does. They beam with delight, they are happy to see you, and the streets are full of people either walking around puddles or splashing through them, and saying, isn’t it great? The sun came out! It happens just often enough to keep me out of jail, but not enough to keep me from being a little too grumpy, a little too often. I bake a lot this time of year. It’s what I do when I’m trapped indoors and in need of a little pick-me-up. After my successful effort with English Muffin Bread, I thought it would be cool to make actual English muffins, so I started researching recipes and, in the way of the internet, discovered there was such a thing as Fruity Pebble Cookies. I have no idea how I got from English muffins to Fruity Pebbles, although technically, they’re both breakfast foods, so presumably that’s the connection. My mother would beg to differ, of course. She bought me a box of sugary cereal exactly once – it was a box of Trix, and I had the flu and could barely taste them, but savored every sugary morsel like the manna from heaven it was. My house now is full of rebellious sugary cereal, yet I had no idea I could bake with it. Cookies, no less: Little color-flecked pick-me-ups for grim, grey days. They’re not an indulgence, they’re a necessity. You want to try these cookies. It’s okay if you don’t live in Seattle, or it isn’t raining where you are. I won’t tell. Even the instructions of this recipe will make your inner child happy: They actually tell you to put a tablespoon of sugar onto two cups of Fruity Pebbles. I will venture there aren’t many times in life when a college-educated, gainfully employed person will tell you to do this. Savor the moment, along with all that sugar. The recipe is from Christina Tosi’s Momofuku Milk Bar cookbook, which moves sugary breakfast cereal to its rightful place on the menu – dessert (another recipe included in the book is Cereal Milk Ice Cream and yes, it’s on my to-do list for warmer weather). Originally, the recipe also included mini-marshmallows, and I bought a bag of them, but then balked at the last minute. If you want to include them, add 1 and 1/4 cups right after you blend in the Fruity Pebble crunch. The cookies were fun to make and smelled outrageously good as they baked. It’s a ton of sugar, but interestingly, even though the cookies are incredibly sweet, it is not in that obnoxious way – the sweetness seems to be tempered a bit, possibly by the additional of milk powder to the cereal. The cookies spread a lot when baking, so you really do want to space them out well on the cookie sheets. You also really do want to let them cool on the cookie sheets for five minutes – they are incredibly fragile right after being taken out of the oven. The Child liked these right after they cooled off enough to taste. The next day, I sent some in her lunch, and she proclaimed they were now Too Hard to Eat with Braces. I didn’t find them hard, but then I don’t have braces. I put them in the cookie jar, where they kept nicely for a week, but did seem to disappear a little faster than I was eating them. Pour the fruity pebbles in a medium bowl. Add the milk powder, sugar and salt and toss to mix. Add the butter and toss well to coat. Some small clusters may form and that's fine. Spread the cereal on a parchment lined baking sheet and bake for 20 minutes, until toasted. Line a baking sheet which with parchment paper. Combine butter and sugars in the bowl of a stand mixer fitted with the paddle attachment and cream together on medium-high for 3 minutes. Scrape down the sides of the bowl, add the egg and vanilla, and beat on high for 7-8 minutes. Reduce mixer speed to low and add flour, baking powder, baking soda, and salt. Mix just until the dough comes together, no longer than one minute. Do not overmix. Still on low speed, mix in the fruity pebble crunch just until incorporated. Scoop out the dough in rounded tablespoons onto the prepared pan. Wrap entire sheet in plastic wrap and refrigerate for at least one hour and up to one week. Arrange the chilled dough at least 4 inches apart on a parchment-lined sheet pan. Bake for 10-13 minutes, until golden. The original recipe calls for 1¼ cups of mini marshmallows. 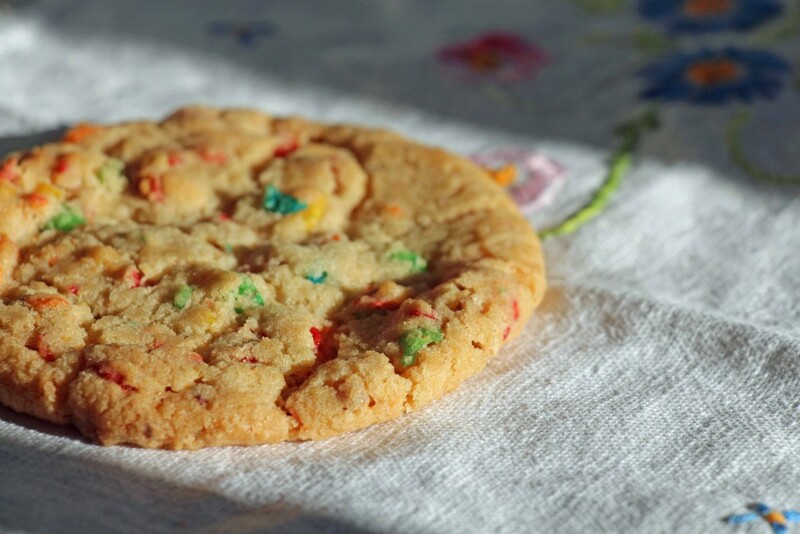 If you want to include them, add them to the dough right after the Fruity Pebble Crunch.